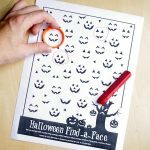 Help the kids channel their Halloween excitement with 4 awesome (and easy!) 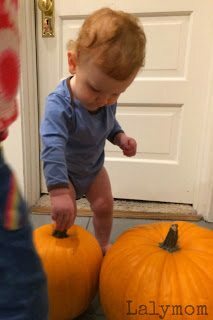 Halloween obstacle courses. It's that time of year where every young kid starts asking over and over, “Is it Halloween yet?” No, dear, and it won't be for a couple weeks. We like to break out the Halloween decorations and kids' books early to ease into it a bit more. 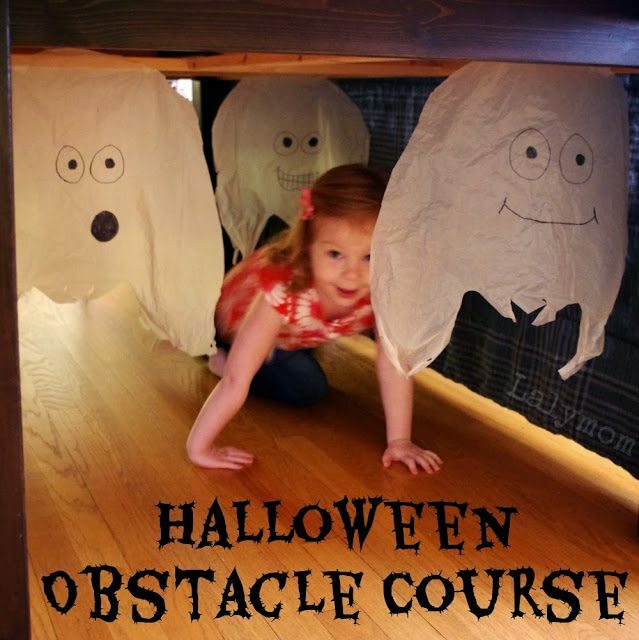 When the Halloween itch hits us hard, these easy Halloween obstacle courses are just the thing to keep the kids entertained. We do love a good obstacle course. Fun! And clearly it is not rocket science. We just used what we had on hand, so you can too! First up is a non-scary kids' haunted house. We used the same set up as our Fire Safety Smoke Crawl. The black blanket was hung over the dining room table. Next it was time for the ghosts! 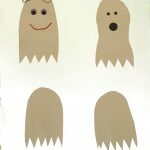 I cut a few plastic grocery bags roughly down the seams, rounding the corners and drew on some friendly ghost faces with a Sharpie marker. Easy, peasy! 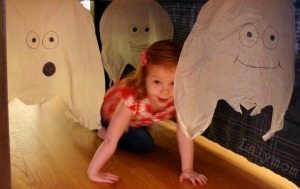 I just taped them up on the under side of the table and we had our toddler and preschooler-friendly haunted house! Ladybug and I (!) must have crawled through the haunted house a hundred times that first afternoon! Sometimes she crawled around them and sometimes she would crawl under them, like she did with the smoke. Of course I made our haunted house pretty non-scary but if you wanted to make it scarier, the ghost faces could easily be spooky. You could dangle spiders and bats from the table, or you could make it much darker of course. The first time Ladybug went through the Haunted House she almost stood up too early and conked her head on the table. Hmm. We had to come up with something to serve as a reminder not to stand up too soon. Sure I could just tell her, but if we are running an obstacle course, I don't expect her to always remember. 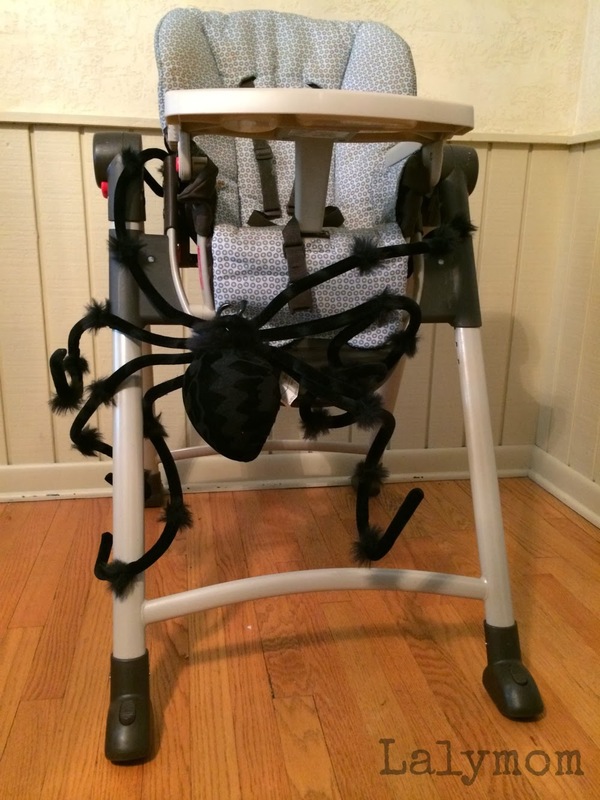 Our simple solution was to make an easy spiderweb by placing our giant store-bought spider on baby brother's high chair. 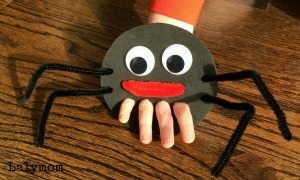 Obviously if you do not have a giant spider, a small spider, or even 4 pipe cleaners or twist ties tied together would make a spider in a pinch. So. After the Haunted house we HAD to crawl PAST the giant spider. We also had some of that meshy stretchy dollar store spiderweb stuff left from our Halloween cutting activities. 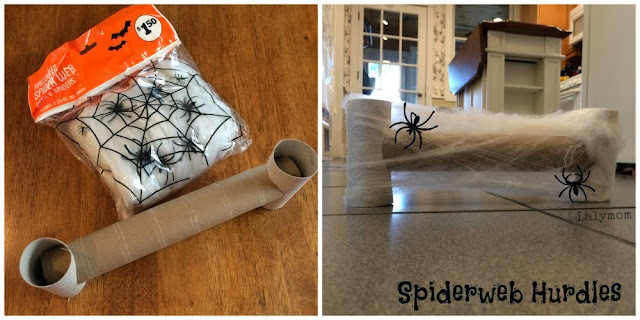 I made a quick little hurdle by cutting holes in two toilet paper tubes, inserting the ends of a paper towel tube into the holes and wrapping the spiderwebs around it. 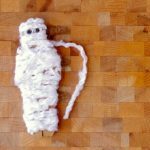 You could obviously make many of these, and you could make them taller by using paper towel tubes or cereal boxes for the sides. We kept it short. The next thing we did was to make a pumpkin patch in the kitchen. We started it off by placing Ladybug's black plastic pet cat on the floor. Scary Black Cat! Look out! Jump over!! (In my head I like to call this obstacle the cat hurdle…heehee.) You can just see the cat's tail in that first picture. We set the four pumpkins we had in a zigzag configuration. 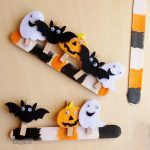 We did all different patterns while running through our pumpkin patch – sometimes straight through, sometimes slalom around, and sometimes hopping over them! 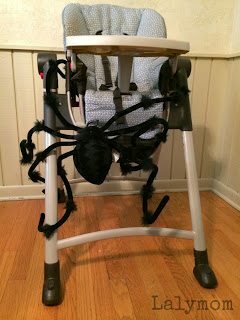 You could easily use your kids' trick or treat buckets, or really any other Halloween decoration for this one. We had a ghost balloon left from our Halloween cutting practice activities. I tied a new, longer string on it and floated it to the ceiling at the end of the pumpkin patch. All we had to do was jump to catch the ghost to finish off the obstacle course. 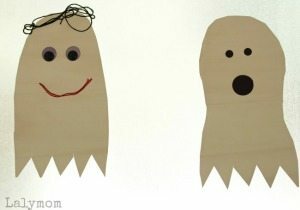 If you don't have a balloon, you could create another grocery bag ghost and tape it or dangle it from a string over a door. Rather than grab it, you could have the kids swat it like a high five. Ta-da! 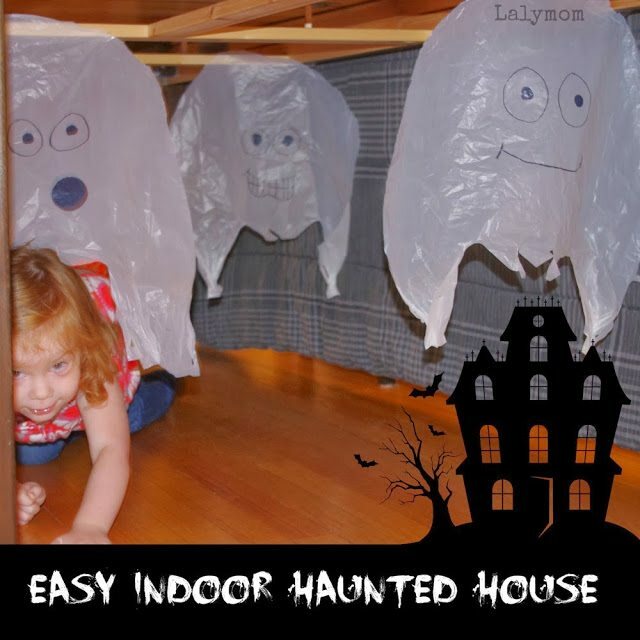 Easy Halloween obstacle courses! Little ones can even get in on the action after he woke up from his nap! 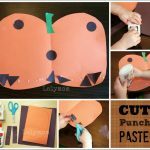 For more Halloween ideas from Lalymom, check out these Halloween Cutting activities, some Fall Art Projects and a fun Cutting Practice Spider! 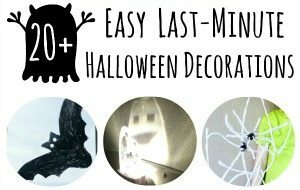 For still more inspiration, come follow my Halloween Pinterest Board. And while you're here, if you're not already following me on Facebook, I'll make it easy with the like button right up there at the top of the page! Thanks for coming by, Happy Halloween! 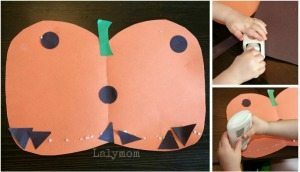 Follow Laura @ Lalymom Kids Crafts & Activities's board [Holiday] Halloween on Pinterest. This looks so fun! And I love how much upcycling you did to create the course. Laura, this is so creative! Ditto the awesome use of recycled materials! Thanks for sharing today! Thanks for the kind comment and thank YOU for sharing! Hi Laura….we LOVE how you incorporated motor skills into this Halloween themed obstacle course! Great ideas! We will be tweeting about it @inspiredtree. I apologize for the deleted comment above…I couldn’t get this comment to post without using my Google ID and, unfortunately, we are dealing with an issue on that page. If you want to see who we are, visit us at http://www.theinspiredtreehouse.com. I didn’t want you to click on our picture and land at nothing!! Enjoy your evening. I love this! 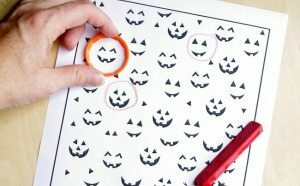 Brilliant- I’m always so focused on art projects, so it’s so fun to see awesome active ideas like this! HA! Oh, so love love love your activities! The hurdle is too cute! My goodness. I can totally see my grand children loving this! Thanks for sharing. I’m going to Like you on fb and follow your boards on PInterest too! Love it! My boys would have a blast with this activity! Oh, what fun! I love this idea. My daughter would too. I’ve featured you at this week’s Pinning for Play link party! Thanks for linking up with us. This looks awesome! I’m always looking for ways to get my kids moving around in a safe and fun way–I think I’m gonna try something like this! Thanks! 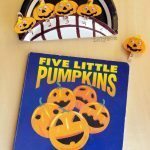 Linking and pinning from the pumpkins Linky Party!